TMUC Career Development Center focus is on collaboration and connectivity among the leading employers; in public and private sector of Pakistan. We inculcate and articulate intellectual debates, symposiums, seminars, discussion forums, industry placements & connectivity as key deliverables at TMUC CDC. At CDC our team of professional trainers and counselors offer graduate education and professional development training programs for Human Resource, Finance, IT, Marketing, Supply chain and Procurement. We welcome stakeholders to collaborate and become part of the Career Development Centre of the leading Transnational Education provider of Pakistan. 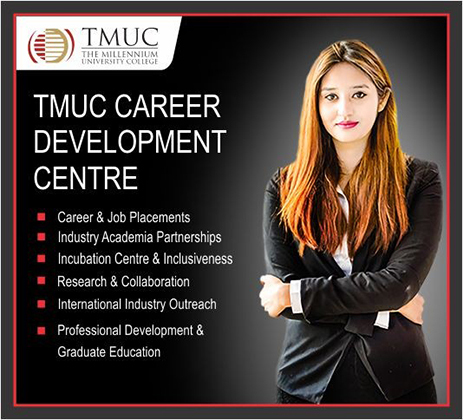 TMUC Job Centre under the portfolio of CDC assists employers to find the best talent pool in the discipline of business management, computing, law, finance, interactive media and fashion studies. TMUC Alumni are working in private and public sector organizations across the globe in different areas of business. TMUC is proud of their student’s academics as well as professional skills which equips them to take on the challenges of the corporate world. TMUC have proudly appointed its students and alumnis for internships, management trainee programs and job placements in the departments of finance, business, fashion design and law. More than 150 students have been appointed through CDC across Pakistan annually. TMUC arranges job fairs in collaboration with leading employers for its alumni and current students to ensure placements and internships. Employers have a chance to interact with the students and initiate the first round of selection by doing resume screening and initial interview. It provides a fair chance to the students to interact with the employers and industry representatives. TMUC CDC offers mentoring sessions catered for the aspiring students to hone their technical and soft skills aiding them to adapt in the corporate world. In addition to core curriculum, TMUC provides soft-skills training, in the areas of grooming, personality development, report writing, change management, presentation skills and other technical knowledge areas. We also assist in providing volunteering opportunities for social causes. TMUC is the pioneer in holding industry academia partnerships across all major cities of Pakistan. We have arranged more than ten symposiums since 2016 focusing on Industry Academia Partnerships. Each symposium had a different theme derived from leading research reports. Representatives from corporates and academia as well as government official were among the attendees of the symposium. The symposiums focus on building the gap between industry needs and future skills required for the challenging world. TMUC provides corporate tuition fee packages for working professionals who want to enroll in Finance, management, Hospitality and other skill based qualifications. TMUC advocates training and knowledge through hands on experienced tutors. TMUC is an institution of higher learning offering United Kingdom’s TNE in Undergraduate, Postgraduate, Professional Skills; Accounting, Laws, Social Sciences, Fashion, Design, Computing, Hospitality, Media, Construction, Teaching and Business Education. By bringing a range of international qualifications TMUC focus is on research and collaboration for students aspiring to venture their area of interest. We have articulated collaborative partnerships, affiliations and supportive arrangements with renowned International Institutions, Universities of Higher Learning and Professional Bodies to assist students in their respective goals. TMUC have Fashion and Business Incubation Centre designed to support the next generation of entrepreneurs in Pakistan graduating from TMUC or other universities. TMUC aims to provide a business inclusive environment with facilities and services to young entrepreneurs which leads them to establish successful business.